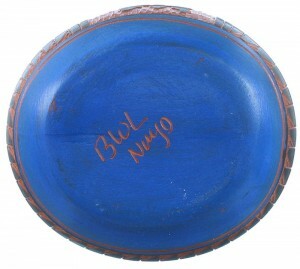 Pot measures approximately 8-1/8" tall, 6" wide and is 17" in. circumference (around its widest point). 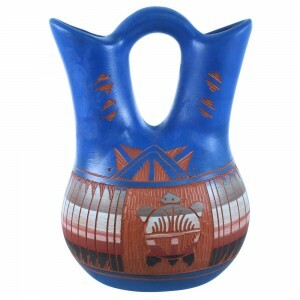 This fantastic Native American Wedding Vase is hand etched and hand painted by artist Bernice Watchman Lee, with an adorable Turtle design, along with other traditional patterns. The pot is signed Navajo and by the artist. 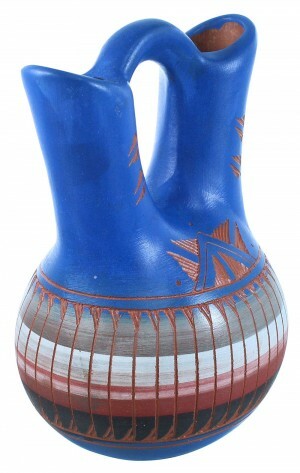 A wedding vase is a traditional Native American Pot, which represents two lives joining together as one. In Native American beliefs, the turtle represents strength, female power, and fertility. The turtle is also considered to be able to defy death.